Are your customers fickle? How well do you anticipate their needs, proactively offer packages at a competitive prices, react to regulatory and competitive changes before they leave you? Today’s banks, insurance and financials firms operate in a fast moving, highly competitive and rapidly changing market. Disruption is everywhere and the customers have choices they can make in an instant from their smart phones. Losing a customer to a more nimble competitor can be as quick as a cup of coffee with a few finger swipes at a Starbucks patio. Particularly in the insurance market, customer interactions are precious and few. An insurance company rep needs to not only delight their customer when an opportunity arises, but also upsell them by offering them a personalized product or service tailored to their need virtually instantly. Nimble competitors now use the latest AI and analytics technology to rapidly discover and deploy intelligent decision systems which can instantly predict customer needs and customize the offering and pricing relevant for the customer at the right time. To achieve and sustain such flexibility, a financial organization needs to modernize its underlying systems. Best companies build a living decision intelligence into their systems, ready to be updated on a moments notice. If a competitor offers a better deal, customer has an life event or data analysts discover a new pattern for risk or fraud, core systems need to be updated virtually instantly. By having an intelligent, AI-driven central decision management system as the heart of your core system, anyone in your organization can have the latest intelligence at their fingertips. Intelligent systems will help verify customer eligibility, provide custom product or a bundle offering at a competitive price, speed up and automate claim adjudication and automate loan origination across all sales and support channels. The heart of this solution is a modern, AI-driven decision management and rule engines platforms that use the latest AI and analytics techniques, have sophisticated cloud offerings providing unparalleled flexibility and speed. Best systems are no longer just for the IT – they allow most business analysts to view, discover, test and deploy updated business logic in a real time. These tools will allow you to discover new patterns from the historical data using machine learning, connect and cross correlate multiple sources of data and incorporate predictive models from company’s data analysts. Updating and deploying new logic is now as easy as publishing a web page and does not require changing the application itself, just the underlying business logic. 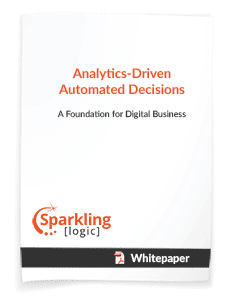 Sparkling Logic SMARTS AI Decision Management is the third and the newest generation of the decision management and rules engine offering using cloud, AI, decision analytics, predictive models and machine learning. We currently process millions of rules and billions of records for the most progressive companies. Find out how we succeeded in creating the ultimate sophisticated set of decision management and decision analytics tools that every modern financial institution should have in their competitive tool chest. Automated decisions are at the heart of your processes and systems. These operational decisions provide the foundation for your digital business initiatives and are critical to the success and profitability of your business. Learn how SMARTS Decision Manager lets you define agile, targeted, and optimal decisions and deploy them to highly available, efficient, and scalable decision services. Being able to rapidly make and deploy changes is important. But how do you know what changes to make? Some changes, like those defined by regulations and contracts, are straightforward. If you implement the regulations or contract provisions accurately, the automated decision will produce the required results and therefore, make good decisions. However, many decisions don’t have such a direct and obvious solution. Frequently decisions depend on customer behavior, market dynamics, environmental influences or other external factors. As a result, these decisions involve some degree of uncertainty. For example, in a credit risk decision, you’re typically determining whether or not to approve a credit application and where to set the credit limit and interest rate. How do organizations determine the best decisions to help them gain customers while minimizing risk? The same applies to marketing decisions like making upsell and cross-sell offers. Which potential offer would the customer most likely accept? This is where predictive models help. 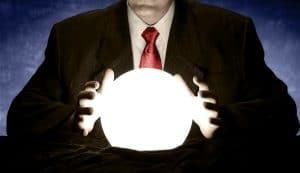 Predictive models combine vast amounts of data and sophisticated analytic techniques to make predictions about the future. They help us reduce uncertainty and make better decisions. They do this by identifying patterns in historical data that lead to specific outcomes and detecting those same patterns in future transactions and customer interactions. 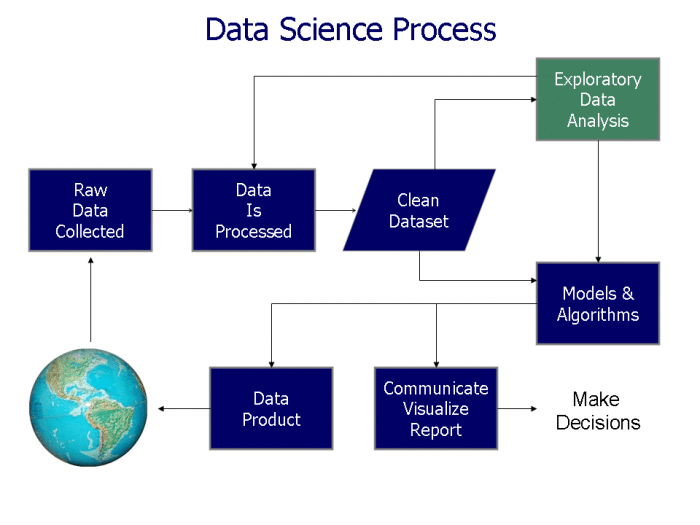 Predictive models guide many decisions that impact our daily lives. Your credit card issuer has likely contacted you on one or more occasions asking you to confirm recent transactions that were outside of your normal spending patterns. When you shop online, retailers suggest products you might want to purchase based on your past purchases or the items in your shopping cart. And you probably notice familiar ads displayed on websites you visit. These ads are directly related to sites you previously visited to encourage you to return and complete your purchase. All of these are based on predictive models that are used in the context of specific decisions. Predictive modeling involves creating a model that mathematically represents the underlying associations between attributes in historical data. The attributes selected are those that influence results and can be used to create a prediction. For example, to predict the likelihood of a future sale, useful predictors might be the customer’s age, location, gender, and purchase history. Or to predict customer churn we might consider customer behavior data such as the number of complaints in the last 6 months, the number of support tickets over the last month, and the number of months the person has been a customer, as well as demographic data such as the customer’s age, location, and gender. Assuming we have a sufficient amount of historical data available that includes the actual results (whether or not a customer actually purchased in the first example, or churned in the second) we can use this data to create a predictive model that maps the input data elements (predictors) to the output data element (target) to make a prediction about our future customers. Once the model is built and validated it can be deployed and used in real-time to inform automated decisions. While predictive models can give us sound predictions and scores, we still need to decide how to act on them. 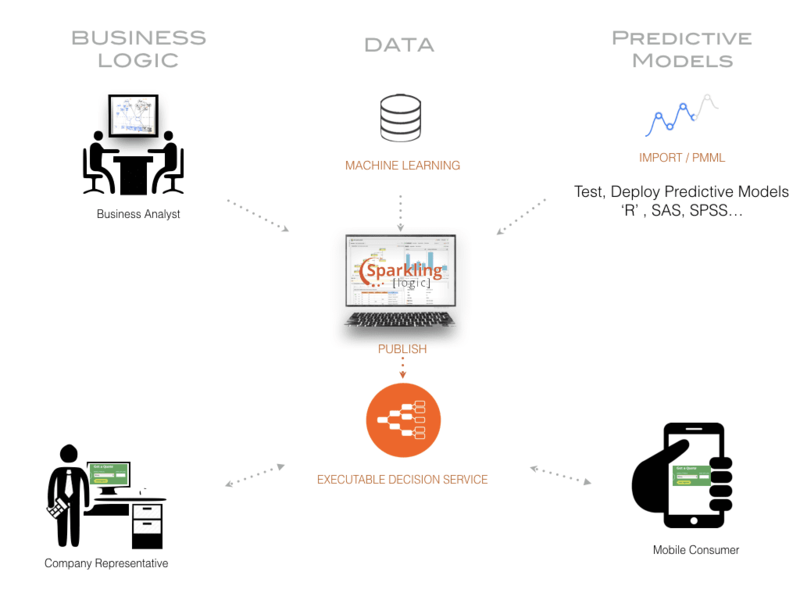 Modern decision management platforms like SMARTS Decision Manager let you combine predictive models that inform your decisions with business rules that translate those decisions into concrete actions. 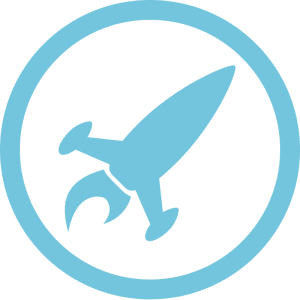 SMARTS includes built-in predictive analytics capabilities and also lets you use models built using other analytics tools such as SAS, SPSS and R.
The use of predictive models is rapidly expanding and changing the way we do business. But it’s important to understand that predictions aren’t decisions! Real world business decisions often include more than one predictive model. For example, a fraud decision might include a predictive model that determines the likelihood that a transaction originated from an account that was taken over. It might also include a model that determines the likelihood that a transaction went into an account that was compromised. A loan origination decision will include credit scoring models and fraud scoring models. It may also include other models to predict the likelihood the customer will pay back early, or the likelihood they will purchase additional products and services (up-sell). Business rules are used to leverage the scores from these models in a decision that seeks to maximize return while minimizing risk. In our next post, we’ll look at how modern decision management platforms, like SMARTS, help you evaluate alternative decision strategies. We’ll explore how you can use decision simulation to find the best course of action. In the decade (or two) I have spent in Decision Management, and Artificial Intelligence at large, I have seen first-hand the war raging between knowledge engineers and data scientists. Each defending its approach to supporting ultimately better decisions. So what is more valuable? Insight from data? Or knowledge from the expert? Mike Loukides wrote a fantastic article called “The unreasonable necessity of subject experts“ on the O’Reilly radar, that illustrates this point very well and provides a clear picture as to why and how we would want both. In the world of uncertainty that surrounds us, experts can’t compete with the sophisticated algorithms we have refined over the years. Their computational capabilities goes way above and beyond the ability of the human brain. Algorithms can crunch data in relatively little time and uncover correlations that did not suspect. Adding to Mike’s numerous example, the typical diaper shopping use case comes to mind. Retail transaction analysis uncovered that buyers of diapers at night were very likely to buy beer as well. The rationale is that husbands help the new mom with shopping, when diapers run low at the most inconvenient time of the day: inevitably at night. The new dad wandering in the grocery store at night ends up getting “his” own supplies: beer. Mike warns against the pitfalls of data preparation. A hidden bias can surface in a big way in data samples, whether it over-emphasizes some trends or cleans up traces of unwanted behavior. If your data is not clean and unbiased, value of the data insight becomes doubtful. Skilled data scientists work hard to remove as much bias as they can from the data sample they work on, uncovering valuable correlations. When algorithms find expected correlations, like Mike’s example of pregnant women being interested in baby products, analytics can validate intuition and confirm fact we knew. When algorithms find unexpected correlations, things become interesting! With insight that is “not so obvious”, you are at an advantage to market more targeted messages. Marketing campaigns can yield much better results than “shooting darts in the dark”. Mike raises an important set of issues: Can we trust the correlation? How to interpret the correlation? There may be some interesting tidbit of insight in there that you could leverage. but unless you *understand* the correlation, you may be misled by your data and make some premature conclusions. Mike makes a compelling argument that the role of the expert is to interpret the data insight and sort through the red herrings. This illustrates very well what we have seen in the Decision Management industry with the increased interplay between the “factual” insight and the “logic” that leverages that insight. Capturing expert-driven business rules is a good thing. Extracting data insight is a good thing. But the real value is in combining them. I think the interplay is much more intimate than purely throwing the insight on the other side of the fence. You need to ask the right questions as you are building your decisioning logic, and use the available data samples to infer, validate or refine your assumptions. As Mike concludes, the value resides in the conversation that is raised by experts on top of data. Being able to bring those to light, and enable further conversations, is how we will be able to understand and improve our systems. Machine learning is everywhere, but the “how” is not well understood by the masses. Andrew Ng, professor at Stanford university, visits the conference for an introduction. When we look at a picture, our brain automatically interprets the information and we recognize it. For a computer, the work is not that simple. Looking at pixels individually could be tedious to say the least. The size of the problem and the variability of subjects make it almost impossible to find interesting correlation at that level. That being said, if we break the problem by applying algorithms that identify smaller components like wheels or handlebars, then the correlation becomes much simpler. Presence of both wheels and handlebar is a decent predictor of a motorcycle — although it could also be a wheelbarrow or dumbbells I suppose. But confusion with trees and pasta would be limited I guess. This technique is called feature extraction. You look for features you can estimate and use those features to teach the system to detect the target subject. Hierarchical sparse coding allows to layer those levels of abstraction to learn how to detect basic trends that, assembled together can allow the detection of “bigger” pieces, like an eye or an ear, then aggregated together could allow face detection for example. This is not specific to image detection. Dr. Ng explained how it could be used for Audio or video. Analytics for business transactions use similar technique to facilitate the creation of predictive models, although the underlying algorithms would be different — the algorithm presented by Andrew is actually more adapted to perceptual data. I talked about some of those principles in Rules Fest 2008 actually in my introduction to Predictive Analytics but we did not blog the show back then; I do not have a link to offer… Let me elaborate a bit on the lingo the modelers use in our space. In Risk Management, features are also called Variables, Calculations or Characteristics. Looking at tons of transactions you may have a hard time detecting patterns of fraud for example. But once you aggregate the data to look at the “feature” that is equal to the number of transactions in the past 3 months for travel expenses or the “feature” that is equal to the time on books in months, you have the opportunity to detect interesting correlation. Those features are then used to train the models — neural nets, linear models, etc. The talk is heavily tainted on the AI-as-data side rather than AI-as-knowledge side. It is good to balance the opposite view offered by Paul Haley on Monday. 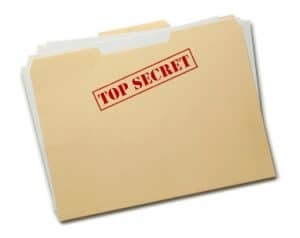 As you know, my vision is actually hybrid – I believe that data and expert should share the spotlight, each with its characteristics, and mixing both can deliver superior value in some other cases. Carlos’s 101 session on Analytics for Rules Writers is a great resource to get started too. i will share the link as the materials are posted. Once again, we are pleased to share with you our discount code for the Rules Fest conference in San Francisco on October 24-26 2011. Feel free to enter code !SparklingLogicRules! to enjoy a 10% discount at checkout with our compliments! Agile Methodology for Business Rules Elicitation. on the current and future state of Business Rules. the algorithm guru with the experienced architect!